How sad it is that today is the last day of the Twas the Night Blog Hop but how sweet it has been showcasing all the fabulous quick and easy Christmas gifts. This hop is all about making quick and easy gifts at the last minute (okay some of you won't make them at the last minute but I will). I have so many ideas dancing around in my head, kinda like visions of sugar plums. Madame Samm at Sew We Quilt in her kerchief and Marlene at Stitching by The Lake in her cap had just settle down for a long winters nap; especially after coordinating this awesome hop and cheering us on. But over in my sewing room there arose such a clatter, you'll spring from your chair to see what was the matter. Away to the mailbox I flew like a flash and ripped open the package and pullout out my stash... from Gramama Jane. I knew in a moment she must be St. Nick. Jane knew exactly what I would like. 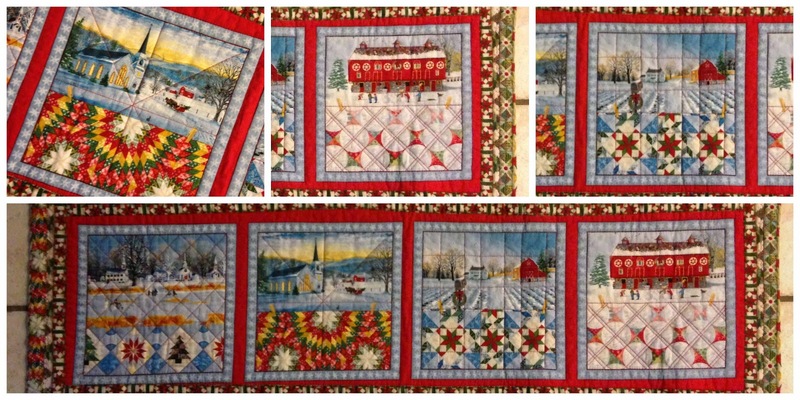 A new Christmas table runner that I LOVE! The King even commented how nice it was. I love the quilts in each of the panels. And the red gingham plastic bag holder. A much needed improvement over my previous bag holder! The pincushion (from Rush Hour fabrics) and the tissue holder are just a cute as can be. 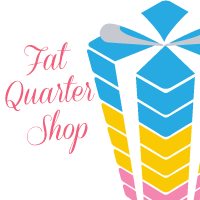 Oh and who wouldn't want more fabric for their stash; a fat quarter and the wrapping around all the gifts. He was dressed all in fur, from his head to his foot, and his clothes were all tarnished with ashes and soot; maybe he should have had one of these garment bags. They're great for men, women, teens... just about everyone. 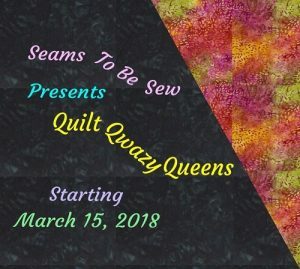 You can use pre-quilted fabric to make it go together faster too. And oilcloth, laminates, corduroy, denim, all durable fabrics to make them out of. Wouldn't it be cute with a ruffle too. Okay, maybe not on this one for the King but with different fabrics. They were quick and easy. The hardest thing was finding a 30" zipper in our little town. You can find the tutorial here. A bundle of toys he had flung on his back, .... ok maybe just a bundle of wood in this firewood tote. Super fast! Maybe 30 minutes! You can find the tutorial here. 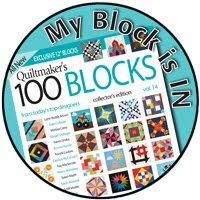 He spoke not a word, but went straight to his work,... at the other quilting blogs up for today. Go visit them and see all their goodies filling santa's sleigh. 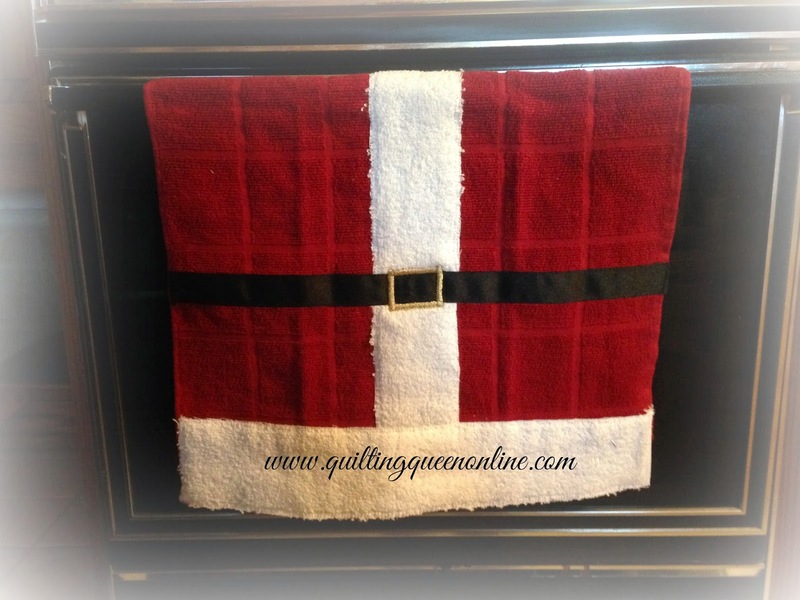 Santa left a nice giveaway under my tree.... An extra Santa Belly Hand Towel just for you. Leave me a comment and tell me if you've started your Christmas shopping. I'll use random number generator to pick a winner. It's open to everyone, I'll ship internationally too. Make sure you're not a no-reply blogger. I can't give you something if I can't contact you. Santa also brought me a new toy... a new Beam & Read Light. It's awesome! It's perfect for handwork; lightweight, bright LED light, magnifying lense, easy to use.... I can't wait to tell you more about it but this post is getting really long so I'll save it for next time. Love your merry gifts and the poem, sew cute! I am a last minute gift maker/shopper. Thank you for sharing and Happy Holidays!!!! This has been a great hop! Your projects are sooo funny, I will start some of those placemats right away, LOL, fantastic! Gorgeous projects, thanks for sharing! Love your Santa's. Sew cute! The sign and chalkboard mini you sent Mdm Samm were lovely gifts. Have a merry holiday season. 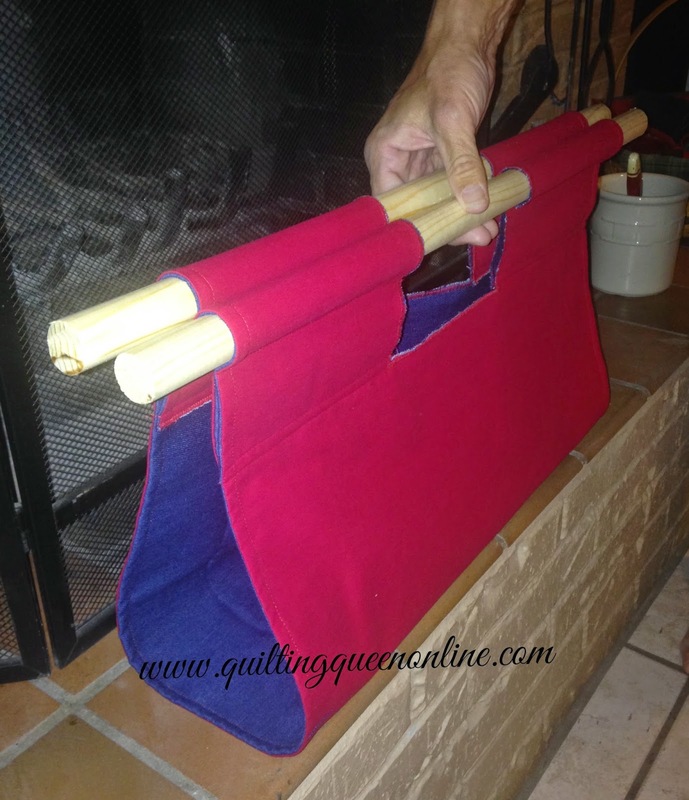 Super table runner and bag hanger. Looked very festive. Great table runner. Love the Santa towel and place mat. Love the gifts you got. Great table runner. Your gifts were awesome too. Love the garment bag. What a great idea! Your so fun Doris, great post ! Your garment bag is super cute and useful....awesome idea ! 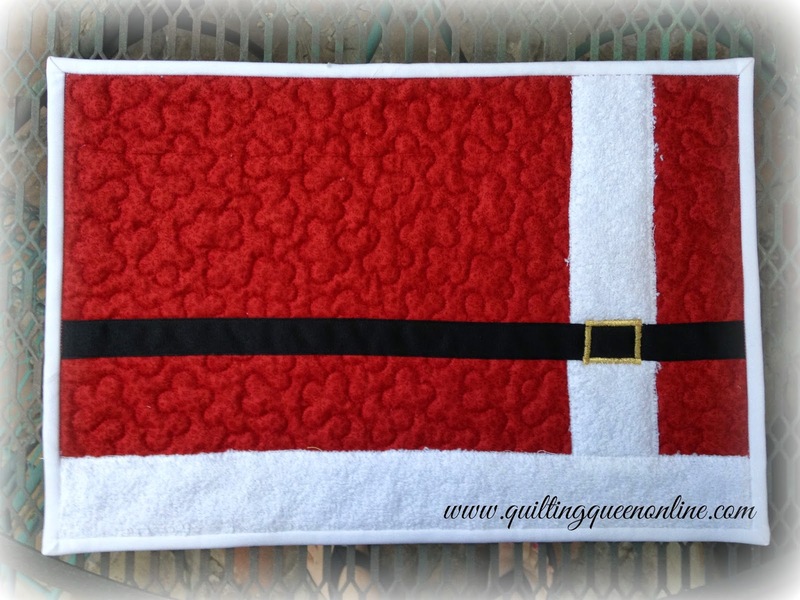 and your Santa towel, place mats and wine cozy are wonderful gift ideas. What sweet things you got from Gramama Jane ! I got a quilted bag holder as a gift once....totally one of my favorite things ! You received wonderful gifts; the table runner is so nice. Your projects are practical, fun, and lovely! Great gifts received from Jane! Very beautiful.Love your santa coordinates! Fun projects! Great gifts from Jane! 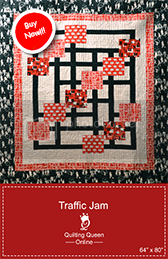 I love that quilty runner. 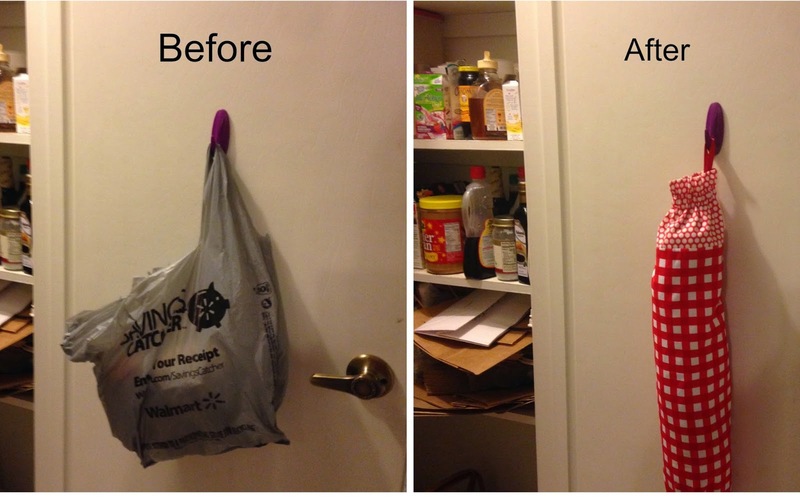 And your "after" shot is quite an improvement for your bag storage. Thanks for the santa ideas too. Merry Christmas! Doris, I love the garment bag--just what my grandson needs. And the Santa projects are as cute as can be. I really love these.They would make awesome gifts. Thank you for sharing and for the giveaway. I haven't started my shopping yet, but I have been making a few things. I haven't started my Christmas shopping yet!! Sweet gifts from Jane and adorable Santa gift ideas...cute, cute, cute! Love the gifts you received. How cute they are. :) I just adore the whole Santa suit set (say that 3 times fast ;) )The towel, placemat, wine bag, and all. Very original. Thank you for sharing your ideas. Have all my purchases made, working on the handmade stuff. Start decorating next weekend! Enjoy your holidays. Beautiful gifts and that Santa wine bag is so fun! Thats a great runner you received, and great gift ideas too. Thank you. Very cute Santa gifts, and I liked your poem. Happy Holidays. Adorable, Doris! I love those little Santa towels and placemats!! Ingenious! I too, enjoyed the poem!!! Lovely table runner and some great ideas for gifts. Don't do a lot of shopping but try to make most of what I give. Did purchase a couple of those caps with the lights built into the brim for the boys. Now can someone tell Santa I want one of those Beam and Read lights!!! Ha ha nice blog! I love, love the santa towels and placemats. You received some sweet gifts too! 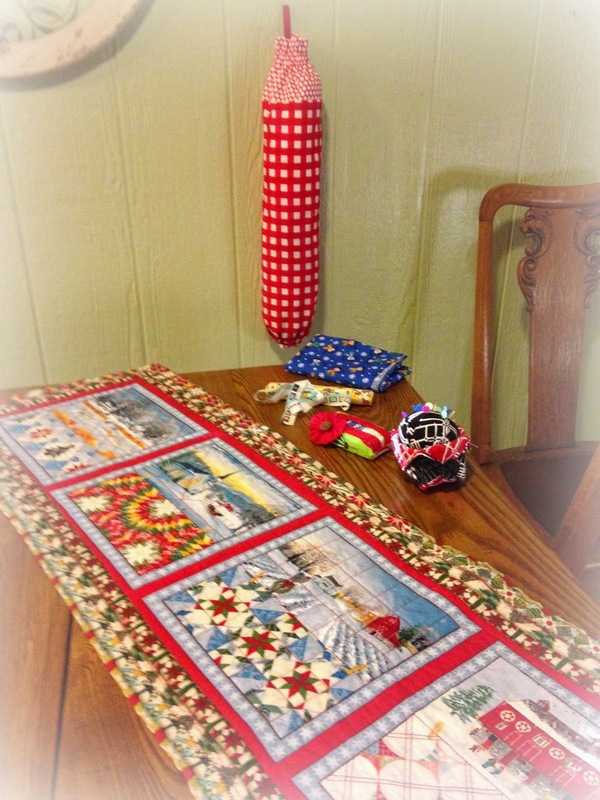 Love the table runner you received. I have started a clothes bag with matching bags for ME...I use zippers off the cheap, worn out garment bags from WalMart. All your Santa "belly" creations were hilarious. Makes for a very Merry Christmas. Thanks. What an absolutely fun post!! Great job on all of your projects ... it certainly makes things look cheery!! I haven't yet started my shopping as I'm still searching for the right things in my mind. I wish you all that is happy and good! Really enjoyed reading your post. I needed the smile this morning because my elderly mom is in the hospital again. third time in less than a month. So thank you for lightening my day. Your projects are all so cute and I have printed a couple of your tutorials to make. I started Christmas shopping last week. Hope you have a wonderful holiday season. Wonderful ideas. Your Santa items are all adorable amd your post is super cute. Cute ideas!!! As far as Christmas shopping?????? I'M DONE!!!!! And it feels good!!! Now I have time for sewing. Hi, Doris! What a wonderful collection of gifts received and given - as well as your terrific ideas for super-quick gifts - the whole Santa collection is adorable. Your table runner is beautiful. And the bag holder is handy to have. Your Santa collection is as sweet as can be, my favorite being the tea towel. I already have the new Christmas ornaments for all 10 grandchildren and one gift. Right now I am sewing on a rag quilt for a granddaughter and have bought the flannel for a second rag quilt for her sister. Such a cute grouping of Santa belly items. Thanks for the chance to win. And I have not started to shop yet. I am one of those December shoppers! I have a few gifts for friends sewn up but nothing for the family yet. Love your wonderful ideas and the gifts you received are lovely. Wow! I love your Santa gift ideas, Doris. So many cute and inspiring gift ideas that look very fun to sew. Thanks so much for sharing them! Oh, looks like Gmama Jane has Santa's touch for giving just the right gifts. Enjoy! 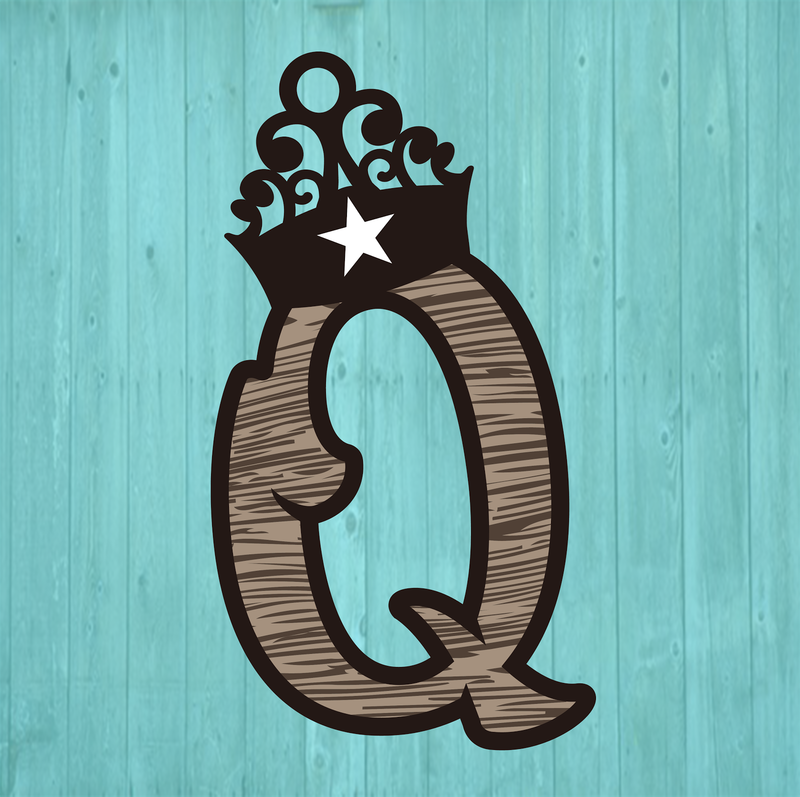 You received some great gifts and shared some of your own fabulous quick gifts. Love the idea of the garment bag. The Santa's Belly ensemble is so very cute. I love it. Thanks for the ideas and for participating in the hop. Thanks, also, for offering a giveaway. Enjoyed the poem and all the gifts. Have just started my shopping but have some things made as stocking stuffers. I have started my Christmas shopping. Been making gifts as well. Merry Christmas. Lovely gifting! I really enjoyed the poem, too, Thank you for sharing in the hop. 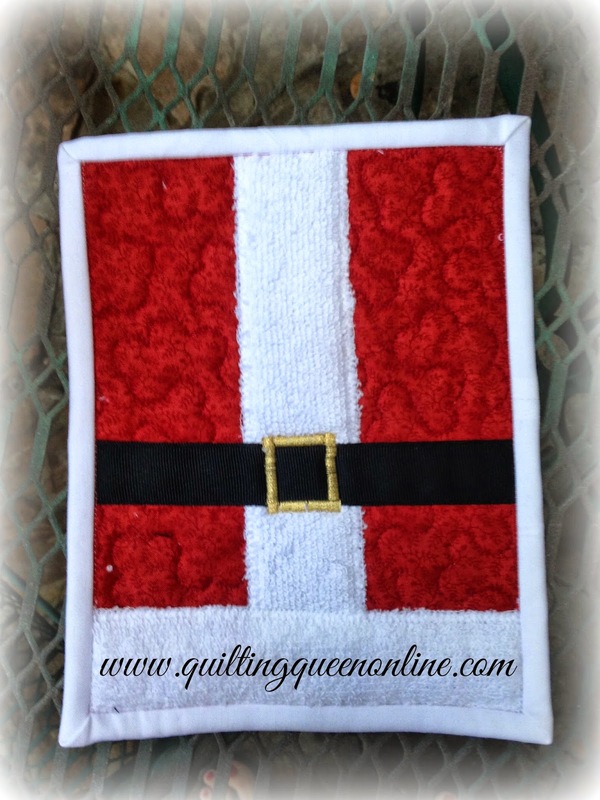 Beautiful quilty table runner "Santa" left in your mailbox! Love the towels,potholder,and placemats you sewed up they are perfect! I have started my Christmas shopping,purchased the first gift back in September. Happy Holidays! So many lovely gifts...received and made. Thanks for sharing. How cute to use that poem as the basis for your post. I love that table runner, too. You had some great ideas for quick gifts. Thought the Santa belly and belt items were all so sweet. I love my Beam n Read light also. Adorable gifts made and received!!! Love that runner!!! My Christmas shopping is finished...just a few little things to make and I'm done!!!!! I'm loving your Santa projects. Sew very cute and useful. You gave me a chuckle with the before and after pictures of your bag storage. Maybe I need one of those too. Lovely gifts received and made! Thanks for sharing, maybe now I'll do some shopping. I have already delivered one of my Christmas gifts...to my mom, since we are going to be out of town. I was lucky to find something at PIQF this year that I hope she just loves. Many more gifts to go though! Your Santa Belly items are terrific...thanks for sharing! Hi Doris! You are so daggone funny! I love your post and your Santa themed towels, placemats, etc. so, so creative! The wood carrier is a great idea too. You have some great gifts here girlfriend...thank you!! Love the idea of the santa placemats! I love how many different things you made. Many people would have stopped at one or 2. Beautiful gifts from Jane...love the table runner...lucky you!! Yes and your wonderful quick gift ideas are perfect too. Love the garment bag!! Thanks for sharing your Santa gift giving ideas!! Happy Holidays!! You had wonderful gifts from Jane, very useful! 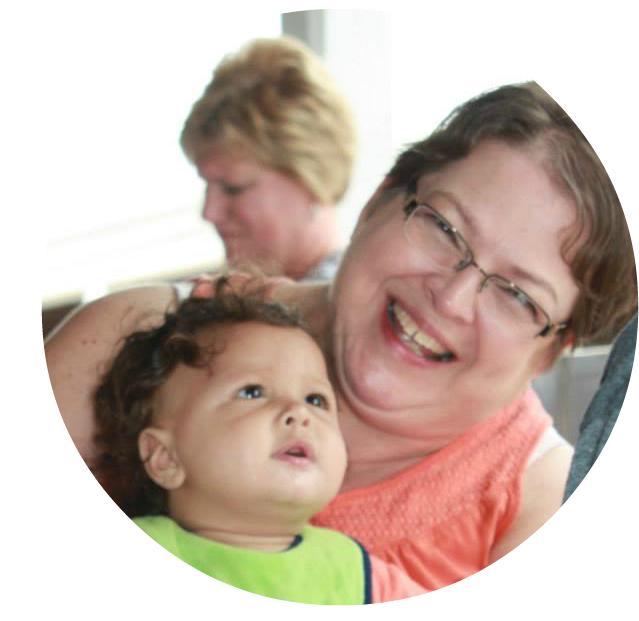 Thank you for sharing good ideas for quick gifts and the chance to win. No I have not started Christmas shopping yet. Happy Holiday to you and yours! Great projects! Lots of quick gift inspiration! Hasn't this been the most fun?! You certainly received a wonderful array of pretty gifts.How clever are you? So cute the way you wove the poem around your post! And you've shared so many lovely ideas that are sure to find their way under my needle. Doris, thanks for sharing your Santa gifts.....you are my inspiration......no, haven't started that Christmas shopping, but have done some Christmas sewing/quilting! Always enjoy your blog! Lovely gifts both received and sent. I love your writing! Merry Christmas.